Auzin can be found in Dalaran, He will sell you toy items and the Zaumzeug des eisenbeschlagenen Geisterstürmers for Zeitverzerrtes Abzeichen, which can be acquired by running Timewalking Dungeons. You can find him in the center of Dalaran, in front of the fountain. When you still have problems with targeting him (huge crowds of %^&*! @bags blocking him). Press Shift + V and click on his nameplate ("Auzin") that opens the vendor window for you. Edit: 03. Aug, Looks like you finally get dismounted when you fly or ride near him. Edit: 05. Aug, Nope no longer. People still blocking. Is his Robe available for us? The items available for Zeitverzerrtes Abzeichens include mounts, toys, and various vanity/utility items, as well as Timewarped gear. The gear is unique, in that it will scale to the level of the character that buys it. It should be noted that the scaling is ONLY when the item is purchased - as such, the item is stuck at the level at which it was purchased (e.g. If you purchase Seherklinge der Fokussierung at level 76, the item will retain stats scaled to level 76, even if that character levels to 77 or higher). Commendation that grants 500 reputation with Ritter der Schwarzen Klinge. Bind on Account. Commendation that grants 500 reputation with Expedition der Horde (Horde-only faction). Bind on Account. Commendation that grants 500 reputation with Vorhut der Allianz (Alliance-only faction). Bind on Account. Commendation that grants 500 reputation with Argentumkreuzzug. Bind on Account. Commendation that grants 500 reputation with Die Söhne Hodirs. Bind on Account. Commendation that grants 500 reputation with Der Wyrmruhpakt. Bind on Account. Item that allows you, every 10 minutes, to travel on the ground very fast (+250% speed) for 15 secs. Similar to Schädel des irren Häuptlings, a Draenor-only item. Toy that is a cosmetic version of the ICC Trinket Wille des Todesbringers. Randomly gives you the appearance of a Vrykul, Iron Dwarf, or a Taunka for 2 minutes. Can be used in and persists through combat. Toy that spawns a Euer zukünftiges Ich NPC, that will greet you and respond to various emotes you make before despawning. *This cosmetic item is ONLY available from Sack voll geangelter Schätze. Commendation that grants 500 reputation with Das Konsortium. Bind on Account. Commendation that grants 500 reputation with Die Sha'tar. Bind on Account. Commendation that grants 500 reputation with Ehrenfeste (Alliance-only faction). Bind on Account. Commendation that grants 500 reputation with Expedition des Cenarius. Bind on Account. Commendation that grants 500 reputation with Hüter der Zeit. Bind on Account. Commendation that grants 500 reputation with Unteres Viertel. Bind on Account. *This recipe is ONLY available from Kiste mit Fleisch. **These recipes are ONLY available from Fass mit Fischen. ***These pets ONLY drop in the Burning Crusade Sack voll geangelter Schätze, but they are cageable and can be traded, or bought/sold on the Auction House. Commendation that grants 500 reputation with Der Irdene Ring. Bind on Account. Commendation that grants 500 reputation with Wächter des Hyjal. Bind on Account. Commendation that grants 500 reputation with Drachenmalklan (Horde-only faction). Bind on Account. Commendation that grants 500 reputation with Wildhammerklan (Alliance-only faction). Bind on Account. The commendations are Bind on Account, and can be sent to other characters. Hence, you can earn Zeitverzerrtes Abzeichens to buy these on an alt, to send to your main. You cannot transfer the badges, but your alts will have to spend what they have earned. That being said, toys, mounts and heirlooms are account bound, and the commendation reputation tokens (e.g. Belobigung der Sha'tar) as well as some other vanity items (e.g. Gräuelschnauzes Reißzahn) are BoA and can be mailed to other characters. GREEN LIGHTNING BOLTS! Go look, this guy has green lightning bolts striking him. It's neat. 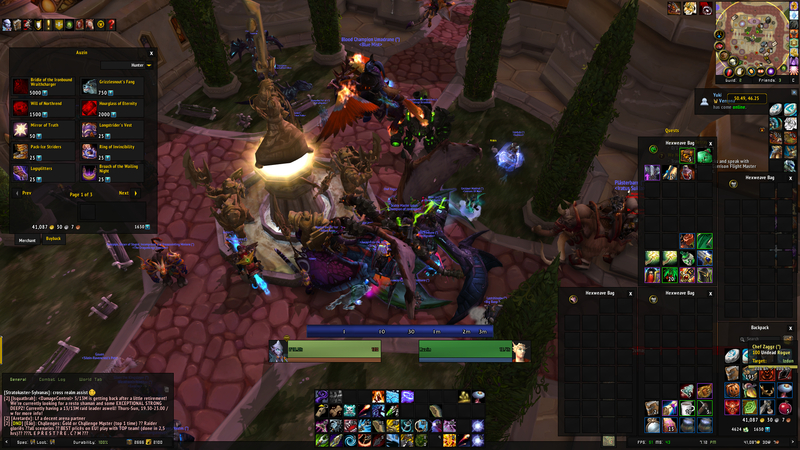 Curently the "dismount area" is gone, so people can block the Timewalking vendors as they please again. Im trying to turn in the quest for the frigid timewarped prism. When does Auzin show up? Man, his 3D animation on right side is borked up. He looks like a contorted figure begging for alms. Creepy! Where the f*** is this guy now? He is in OLD Dalaran (Northrend), not the new one (Broken Isles). This npc is no longer in Old Dalaran. Cannot be found in the entire city. This must be in regards to NEW Dalaran.